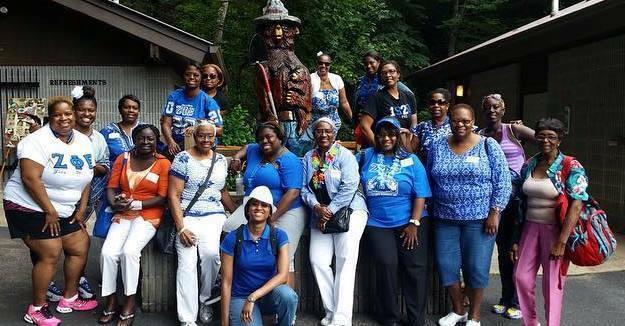 The KIZ Retreat was held on Saturday, August 15, 2015 and was attended by 44 Sorors. The retreat started at 8:30 AM at the Sigma Zeta Foundation and ended with a trip to Helen, Ga. This year the retreat was a Hawaiian theme and everyone dressed in their best Hawaiian attire. Each registered soror received a Zeta Tote bag with their name personalized on it and prizes were given out to the soror with the best Hawaiian outfit and the soror who was able to limbo the lowest. Before the trip to Helen, chapter members heard from Basileus Shannon McGuire-Lee about the vision and goals for the 2015-2016 sorority year, then two guest speakers presented informative workshops on your rights when dealing with the police and how to build effective teams. After collecting boxed lunches, the chapter departed on the party bus to Helen. While in Helen, some sorors chose to tour the historic downtown district while other sorors walked up Anna Ruby Falls. After both activities, sorors enjoyed dinner from a local restaurant while traveling back to Atlanta. Sorors who attended the retreat also donated school supplies for our Z-HOPE adopted school Hamilton E. Holmes Elementary. Each soror was asked to bring a minimum of $10 worth of school supplies for students and teachers for the upcoming school year. The retreat and the back to school drive were very successful. Kappa Iota Zeta is looking forward to a successful and productive sorority year!